The color choices are a bit out of my comfort zone since I usually stick to jewel and icy winter colors plus black and white, but I went with them anyway. 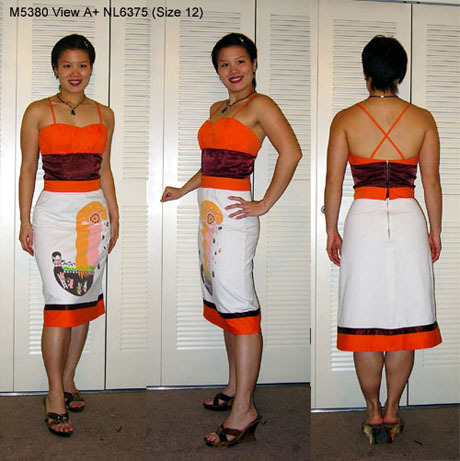 The original patterns didn’t include the orange belt or the brown and orange band around the hem of the skirt, but I added them at Chris’s suggestion to tie everything together. I really like the final result, but have been wondering if it was just too off-the-wall to wear out. Well, as of last night I am no longer concerned. Check out my review of this project at Pattern Review for more details. This entry was posted in Projects, Sewing. I LOOOOOVE your dress. It’s so fab, very now and hip. You look awesome.